Home / Becky Adlington Training is coming to Wrexham! Becky Adlington Training is coming to Wrexham! It’s exciting news for Wrexham and surrounding areas as the first Becky Adlington Training course in Wales is set to launch on 25th May, at Total Fitness Wrexham. The full host of courses will be offered, including the Level 1, Level 2 and Combined Swimming Teacher Qualifications. 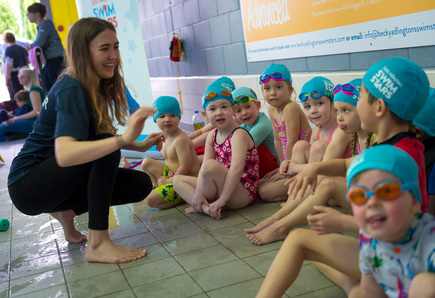 The Combined ASA Level 1 (Swimming Assistant) and ASA Level 2 (Swimming Teacher) qualification provides you with the industry standard to work as a fully qualified swimming instructor in just 9 days – Fast track learning only available with Becky Adlington Training. The courses offer the highest quality tutoring for those who want to learn how to teach ‘the Becky way’, including her values and top tips for teaching swimmers from beginners to advanced. Becky’s expertise, along with industry experts who assisted in writing the training programme, guarantee that each course is packed with fun, effective and high-quality teaching methods to suit individual needs… and it doesn’t stop there! After completing the course, many of our newly qualified teachers will be given the opportunity to put their new skills to use with Becky’s Learn to Swim programme, Becky Adlington’s SwimStars or its sister company, Total Swimming Academies – developed by fellow Olympic Medallist, Steve Parry; Both of which have locations across the county and are always looking for high quality teachers. Becky Adlington Training was developed by 4-time Olympic Medallist and Britain’s most successful swimmer, Becky Adlington after she set up SwimStars, her industry-leading Learn to Swim programme for children. Her goal was, and still is, to ensure that every child has the opportunity to learn the essential life-skill of swimming. To achieve this, she realised the demand for high quality teachers who could give children the best swimming journey possible, needed to be met. So, Becky teamed up with two of the country’s leading Learn to Swim experts to create Becky Adlington Training, which is proud to be a ASA Approved Centre that now delivers courses across the UK.